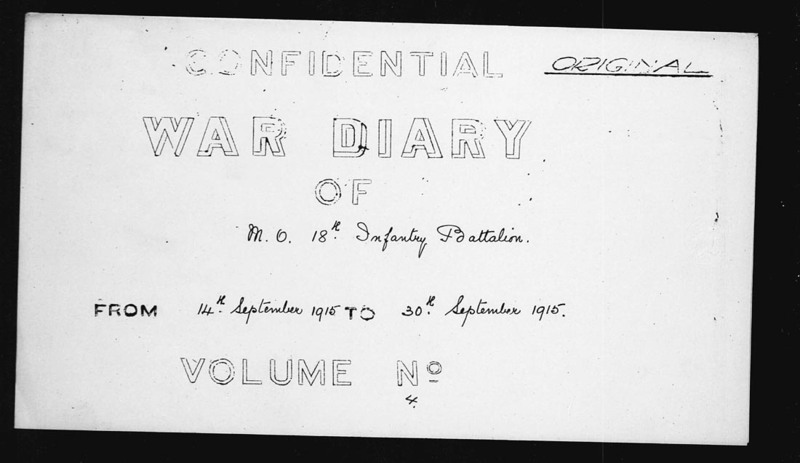 Note: This is the Medical Officer’s War Diary and offers some many illuminating insights into the life of our Canadian soldiers. 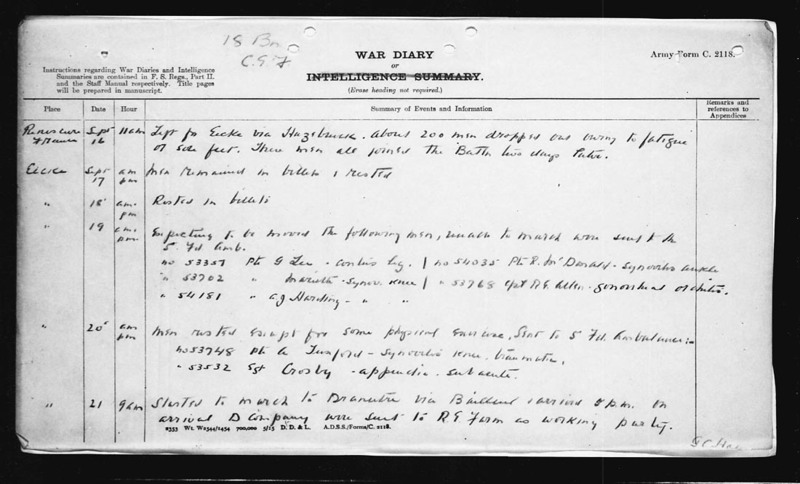 Sadly, the war diary has a lot of parts that are illegible and consequently it is very difficult to deduce the writing and the mean there of. Included are the images downloaded from the Archives for your reference. 9:30 PM – Left the docks entroute to Boulogne. 10:50 PM – Rammed by British destroyer: have to be towed to Boulogne where we arrived at 56m [56 minutes after midnight?] illegible men jumped on the destroyer at the time of collision and rejoined the Battalion for days later. 6:15 – Entrained for Saint Omer. 10:30 – Started march from Saint Omer to R[illegible] arriving there 2[illegible] and billeting for most of the night. 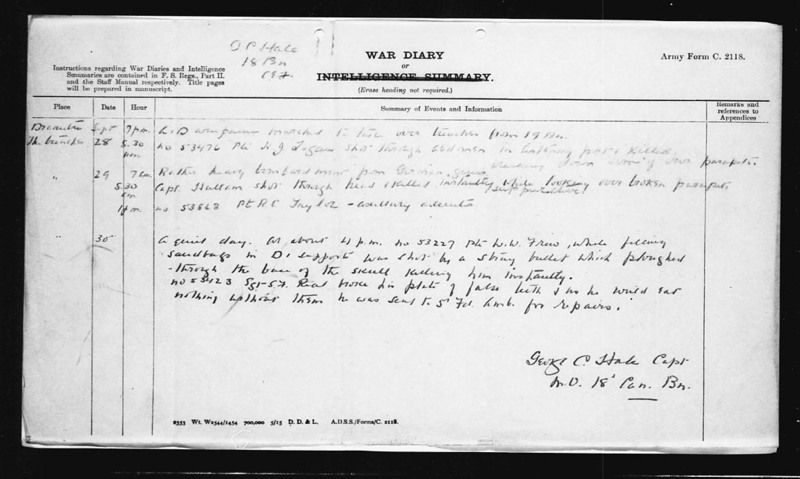 Sept. 16: 11 AM – Left for Eicke via Hazenbrouck. About 200 men dropped out owing to fatigue or sore feet. These men joined the Bttn two days later. Sept 17: am/pm – Men remained in billets & rested. Sept 18: am/pm – Rested in billets. Sept 19: am/pm – Expecting to be moved. The following men, unable to march were [illegible] Amb. Sept. 21: 9 am – started to march to Dranutre [place name illegible] via Bailleul [place name illegible]. Arrived 5 p.m. on arrival D Company was set to R.E. Farm as working party. Sept. 22: Rested in camp areas. Sept 24: Rested in camp. 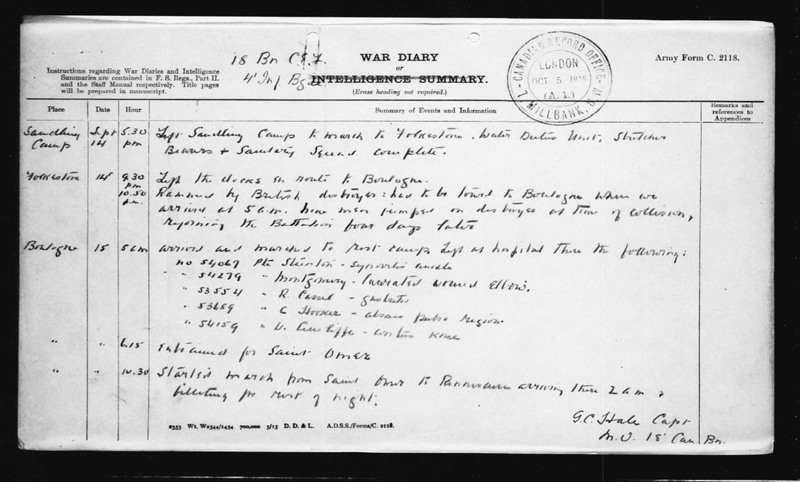 Sept 25: 2 am – Battalion called out to man reserve trenches. Casualties Major Sale with sprained ankle, sent to 5 7d Amb. Sept. 26: In reserve trenches all day. C + B companies went into first line trenches, A + D returned to cam at 7 pm. Sept. 27: Rested in camp area. 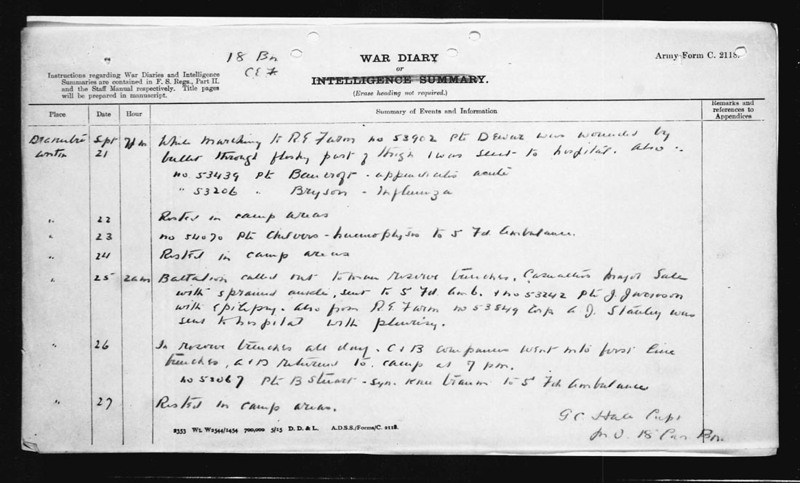 Sept. 28: 7 pm – A + D companies marched to [illegible] over trenches from (19?) Btn. Sept. 29: 7 am – Rather heavy bombardment from German guns. Sept. 30: A quiet day. At about 4 pm No. 53227 Pte W.W. Fries(? ), while following sandbags in D support was shot by a stray bullet which ploughed through the base of the skull killing him instantly. No. 53428 Sgt. S.J. Real (?) broke his plate of false teeth [illegible] would eat nothing without them. He was sent to 5 7d Amb for repairs. The 18th Battalion C.E.F. was “blooded” in this month. After training in England since May 1915 the battalion was shipped to France and then marched to the Ypres area for acclimation and eventually combat in the trenches. The battalion suffered several casualties of varying seriousness but it had its first men killed in action. Coincidentally, on September 29, 1915 two soldiers died but only Captain Hallam in listed in the Medical Officer’s War Diary. Also died that day was Pte.LOGAN, HERBERT JOHN, 53746. He was 22 and the son of E.R. and M. Logan of Brantford, Ontario. See link for more information on this soldier. Listed in the Christmas Expositor, Christmas 1915, Brantford Ontario.